1BR/1BA, 420 sq ft ocean view property — March Special going on right now. 'Alani House sits on a cliff overlooking the Pacific Ocean, and Honoli'i Beach is at the end of the block. With direct access to the black sand beach and lifeguards on duty, Honoli'i is one of the Big Island's favorite destinations for swimming, snorkeling, kayaking, and surfing. With a panoramic view of the ocean, you can watch whales and cruise ships from the front lanai. There are 3 lush waterfalls within easy walking distance from the house. We are only 2.4 miles (about 3 to 4 minutes) from downtown Hilo along Hilo Bay and the Hāmākua Coast. Driving to the airport takes only 10 to 12 minutes. 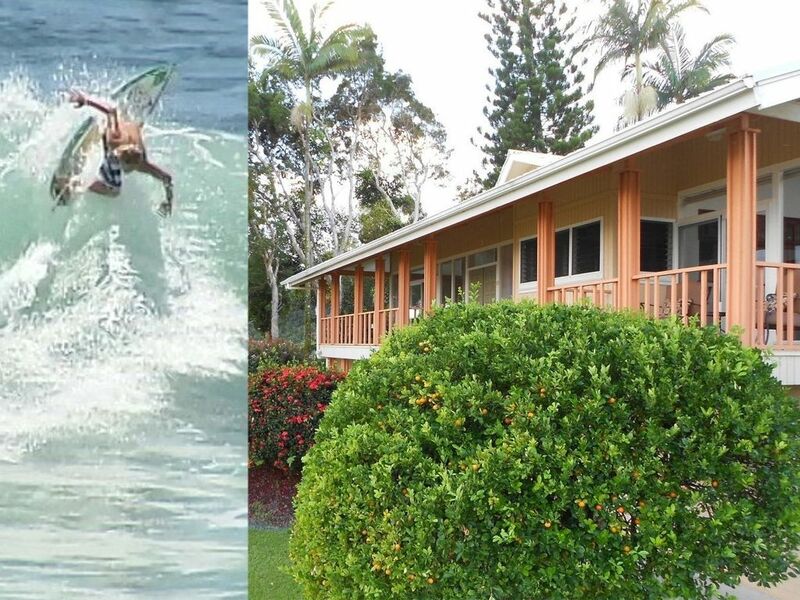 There is easy access in and out of the ocean with lifeguards to protect you and your family. The constant trade winds keep our air clean, our water is purified municipal water, and we provide wireless connectivity via high-speed internet cable modem. Driving south, downtown Hilo is only 4 minutes away. Another 4 to 7 minutes will get you to four additional swimming and snorkeling reefs. At about the same distance are Rainbow Falls, Kaumana Caves, Lyman Museum, Ocean Discovery Center, Pacific Tsunami Museum, 'Imiloa Astronomy Center, and the Queen Liliuokalani Gardens. Another surf break, called Pohoiki, located at the Isaac Hale Beach Park is about 45 minutes away. While there, you are within 2 miles of the Kapoho tide pools, Lava Trees State Park, and MacKenzie State Park. Within 50 minutes from 'Alani House, you can drive to the hiking entrance for flowing lava, or to Mauna Kea where you can view the North Star and the Southern Cross in the same night sky. Driving north from 'Alani House, you will find a scenic drive within 5 minutes, and Akaka Falls about 25 minutes away. An additional 30 minutes will get you to the sacred valley of Waipi'o. You can descend into the valley, or just take photos from the breathtaking overlook. Are you a visiting physician and need an extended stay? We have experience working with medical staffing companies. And consider this when choosing a location, Alae Point has several advantages over Hawaiian Paradise Parks. Alae Point is only 5 to 7 minutes from the hospital and there are 2 routes to get there. HPP has only one main road and it can take from 40 to 55 minutes depending upon traffic. We are professionals who love and enjoy the unique beauty of each Hawai'ian Island. Walk two blocks to the beach. Nice clean, comfy place just minutes from the beach, surf full of turtles and surfers. We would give five stars if there was a separate kitchen area to prep and clean up meals. There is a microwave, small fridge and coffee maker. The room is large with a comfortable bed. The lanai is sheltered and fairly private. Rory was very attentive to our needs. The locale is very convenient for exploring the east coast of Hawaii and Volcano National Park. A lovely suite in a lovely residential area a few minutes from downtown Hilo. With your own beach down the road! Wren & Rory were excellent hosts. The apartment was clean and comfortable. We would stay again. Beautiful room and location. Very clean. Easy parking. Location could not have been better. Ren and Rory were great hosts. Thank you so much for providing us with an experience we will cherish forever.